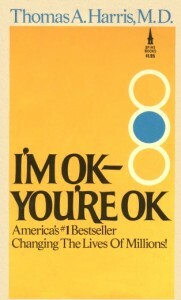 Remember the book, I’m OK—You’re OK? Hard to believe it was published in 1967—when I was a sophomore in high school. I wasn’t reading self-help books when I was 16. Or even as a 21-year-old in 1972, when it was number one on the New York Times best-sellers list for nonfiction and I had already been married for two years. I’m not a proponent—or even a student—of transactional analysis, but I probably could have used a dose of Dr. Harris’ wisdom about then. I was caught in a cycle of self-loathing, body image distortion, and eating disorders. But I was also involved in a religious movement that scorned psychology. I was supposed to just trust Jesus and everything would be okay. Or not. Did it take Chaplin 70 years to learn this? Does it have to take that long? My children are all in their 30s. They have good jobs. Two of them are married with children. One of them owns a lovely home. They are all working hard, trying to make a good life for themselves and their families. My wish for them today is that they recognize what wonderful people they are and follow Charlie Chaplin’s advice for embracing a healthy egoism. Maybe by the time they are my age they will have enjoyed a happier life for many years. Me? 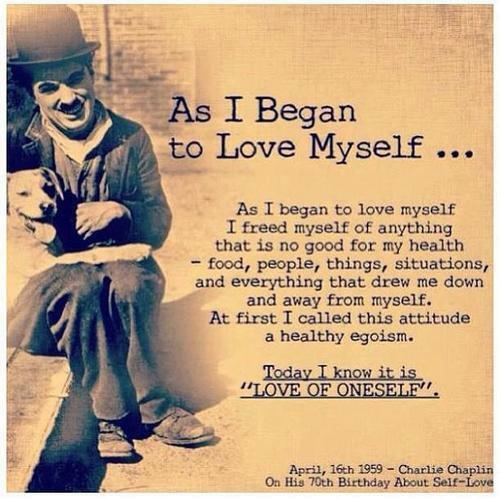 I’m moving forward with Chaplin’s advice—learning to love myself, and to free myself from things that “draw me down and away from myself.” Chaplin called this “a healthy egoism.” Sounds good to me. Have a great Monday, everyone!